Senior goalkeeper Tyler Miller was named Big Ten Defensive Player of the Week for the second time this season. Northwestern has allowed only 1 goal in seven games this season. After slugging to an exhausting, scoreless draw in its second Big Ten fixture of the season, Northwestern (3-1-3, 0-1-1 Big Ten) will look for an outlet for its frustration against cross-town opponent DePaul (3-3-1, 0-0-0 Big East) at home Wednesday. Despite the Wildcats’ inability to put the ball into the back of the net, there were many positives to take from NU’s defensive performance against the Wolverines. Following shutouts against Michigan Sunday and Valparaiso last Wednesday, Cats goalkeeper Tyler Miller was honored as the Big Ten Defensive Player of the Week, his second such award of the season. Miller is tied for the lead for shutouts in the Big Ten with five shutouts in his seven appearances this season and will be looking to extend his streak against DePaul at Lakeside Field. 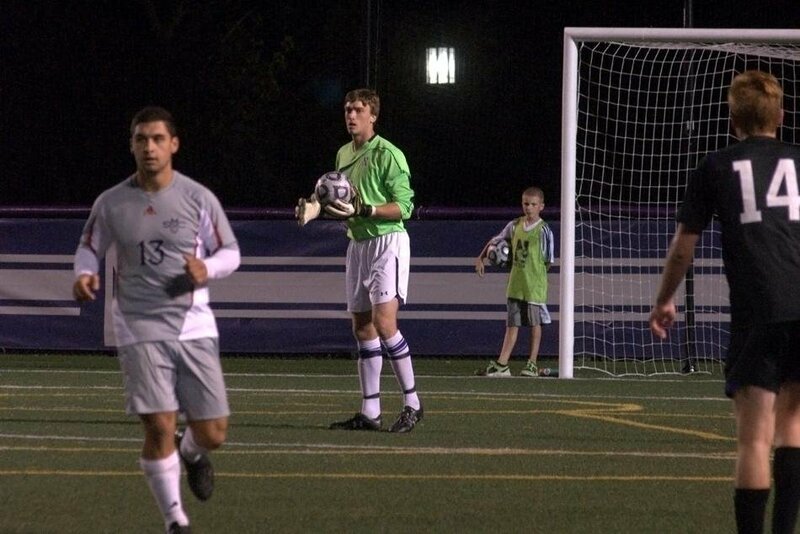 He has played every minute of the season so far for NU and has made 21 saves, conceding only 3 goals. The Blue Demons are also coming off of a double-overtime fixture over the weekend. However, they lost 2-1 against the University of Illinois-Chicago. Previously they defeated Drake and drew against Southern Illinois University Edwardsville. The last time the two teams met was a dramatic affair in September 2013. NU defeated DePaul in the dying seconds of double overtime in a match that ended 1-0 with the Cats playing away from home. The Blue Demons hope to avenge the loss, especially against their local rivals. The Cats have scored all of their 7 goals this season in the second halves of their games and will look to get started quickly offensively against DePaul. Lenahan lamented some of the injuries which have previously afflicted his team after the game Sunday. Forward Joey Calisitri has been NU’s biggest offensive producer this season, scoring 3 goals and assisting another. Calisitri has taken 15 of NU’s 64 shots, with six of his shots finding the target. The junior found the back of the net once in the match against Quinnipiac and scored a brace in a 3-0 win against Hofstra at Lakeside Field, the first and second matches of the season, respectively. Since then, the accomplished forward has not managed to get his name on the scoresheet but was able to notch an assist against Valparaiso on Wednesday. Despite being listed as a defender, DePaul junior Jalen Harvey has scored 4 of his team’s 11 goals this season from 14 shots. The Bermudian has an impressive shots on goal percentage of 50 percent.